Two weeks ago I went on a week-long flight and hotel review trip that took me from Ibiza to mainland Spain and ended in Germany. 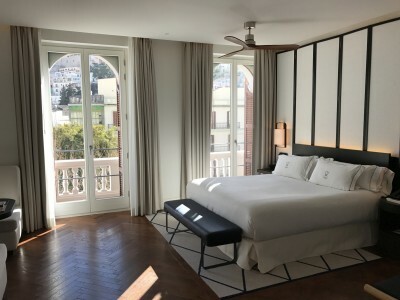 My first stop was at the Gran Hotel Montesol Ibiza, part of Hilton’s Curio Collection, and here is my review. This is not your typical Hilton by a long way. 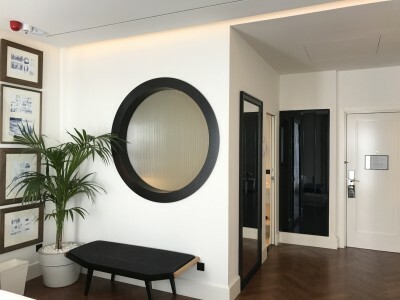 With just 33 high-end rooms, it is exactly the sort of boutique property that the Curio Collection hoped to attract. Hilton gave me a free night including breakfast. HFP paid for its own flight and incidental expenses. 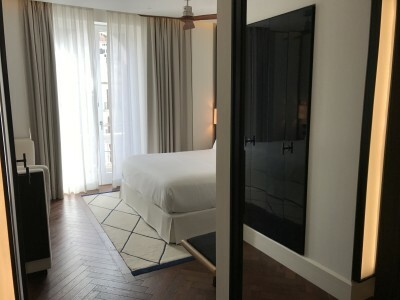 Hilton asked Head For Points to fly to Ibiza to review the newly refurbished Gran Hotel Montesol which is one of the latest additions to the ‘Curio Collection by Hilton’. As you can see from the Curio Collection website here, it is the equivalent of Starwood’s ‘Tribute’ or Marriott’s ‘Autograph’ chains. It consists of 35 luxurious independent hotels which retain a high degree of autonomy in how they operate day to day, are very lightly branded but can still benefit from Hilton’s marketing scale. This includes allowing you to earn or redeem Hilton HHonors points on your stays. This was the second time I have been to Ibiza in Winter and even though it’s only slightly warmer than in London at that time of the year, it’s still nice to exchange the misty polluted London air with its grey skies for a sea breeze, blue skies and a bit of sunshine. The Gran Hotel Montesol is close to the harbour and on the edge of the old town. 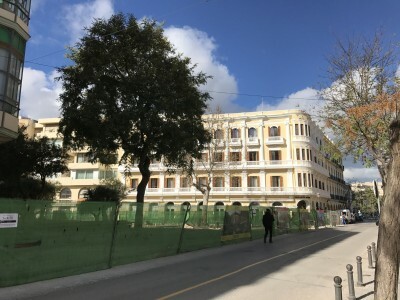 The hotel was built in 1930 and opened in 1933. It was the first hotel on the island of Ibiza. However over the years it lost its glory and had only one star when it closed three years ago. 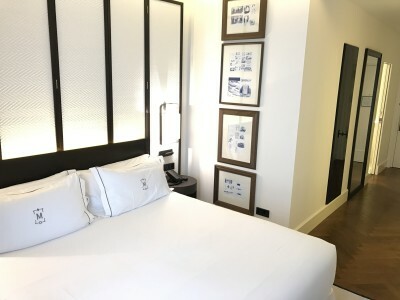 After a vast and expensive refurbishment it opened again at the end of August 2016 as the ‘Gran Hotel Montesol – Curio Collection by Hilton’ with 5 stars on the door. And very nice it is too. There are currently road works next to the hotel where the public square is being brushed up and turned into a pedestrian only zone with bars, cafes and shops in time for the 2017 summer season. For this reason the taxi I took from the airport (€16.55) had to drop me off around the corner and I walked the last 50m. 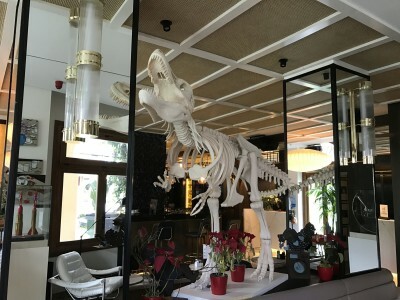 The first thing you see when entering the hotel is a dinosaur skeleton which represents the hotel being the dinosaur of hotels on the island. As you walk past the dinosaur you get to the hotel’s reception. There was only one check in desk and I had to wait a few minutes as someone else was being checked in when I arrived. However as the hotel only has 33 rooms in total, I assume the maximum waiting time should usually be just a few minutes. I was given a Premier Room with city view. There were two ‘french balconies’. In theory they are proper balconies, but due to safety reasons two metal poles prevent guests from stepping outside. The bed was massive and had a comfortable firm mattress. I really liked the monochrome decorative theme in the room. The wardrobe had robes and slippers (black flip flops), an ironing board with iron and a safe. 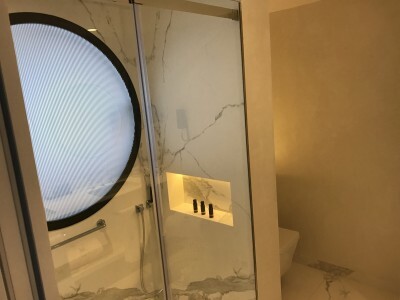 The bathroom is in one corner of the room with a sliding door next to the mini bar and a round glass window next to the bed – you can’t see through it. 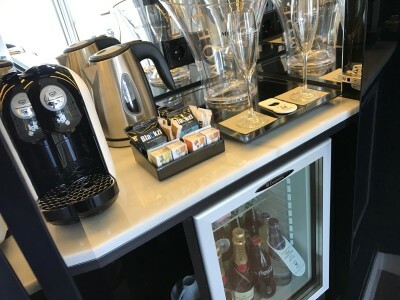 There was a coffee machine with four coffee capsules and a kettle with various teas in the room. The water in the mini bar was complimentary. The bathroom was a good size with two sinks and a shower. There was no bathtub – none of the rooms in the hotel have one. 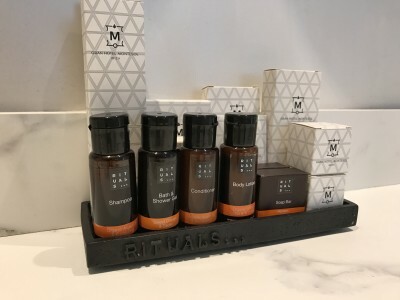 The toiletries were by Rituals, a brand that doesn’t use parabens and SLS. If your hair is used to parabens and SLS (sodium lauryl sulfate) in shampoo it can look a bit dry and dull after using the Rituals shampoo and conditioner. However if you use shampoo without parabens and SLS anyway, this shampoo is great and it smells very pleasant. Wifi is complimentary throughout the hotel and a decent speed for Netflix. (I finally watched the new Gilmore Girls episodes). The Gran Hotel Montesol Ibiza has got 33 rooms including one accessible room, 3 suites, 12 premier, 6 superior and 11 classic rooms. The style and decoration in all rooms is the same and most rooms only vary in size. However the accessible and the classic rooms do not have a french balcony. There are rooms with city view, harbour view and interior view (or rather courtyard view). This is a Classic room. As you can see it’s similar to the Premier I stayed in but lacks the bench and bathroom window in the wall next to the bed. The Superior room was very similar to my Premier room but with slightly less space between the bed and sitting area. 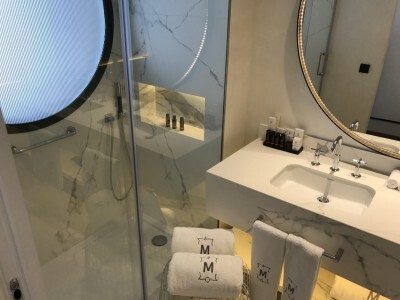 This was the bathroom in a Superior room – it’s bigger than it appears in this picture. There is a second sink next to the one shown. It was impossible to take a photo of the whole room. 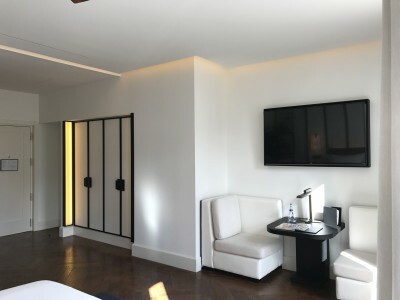 To give you a better impression of what you can expect, here is a short YouTube video of the my room and a few other shots from around the hotel. You can subscribe to our YouTube channel via this page – this is the same link to visit if the video does not automatically appear below. 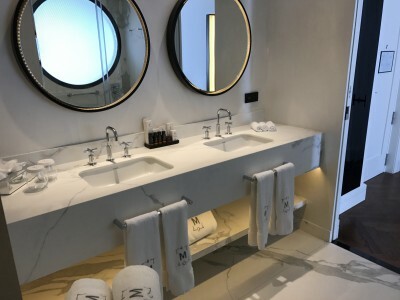 This was part one of my review of the Gran Hotel Montesol Ibiza – Curio Collection by Hilton which gives you an impression of the rooms. In part two (click here) I will look at the public areas of the hotel including the restaurant and art work. If you received this article by email, you will need to click through to read part two – it has not been sent to you automatically. Join the Automobile Association and save ££££'s on hotels! Any details on the 360 camera setup you used? I am interested in buying a setup to take pictures of rooms.. The market is changing all the time and there may be better options than the Ricoh. I tested the Ricoh for a weekend in the Hebrides last July. Very ergonomic but image quality quite poor for any big screen viewing, but looks good when viewed on mobile devices. The App is reliable & at the time was the only one to offer in-app editing. I now have Samsung 360 which is bulkier but much better in terms of image quality. But it only works if you have a Samsung phone. Nice review. OT but Hilton related – Anyone know if Hilton Diamond status valid until March 2017 means it will be honored till the end of March? Considering a Hilton stay on March 29, but only worth it with status benefits. I status matched to Hilton Diamond last year, but was only offered status to end Dec 2016. I sent them a request to extend to end April but got no reply, however, at the end of the year, they renewed Diamond status to the end of 2017. You can check the expiry of your status directly on your profile, and it may be worth an email to ask for an extension. News today on inside flyer of extended Hilton status match/challenge. Requires stays. If you status-matched it could be until March 2017 or 2018 depending upon which offer – unfortunately the website doesn’t tell you which! This review focuses on completely the wrong things, the real question you should be answering is “Are the new Gilmore Girls episodes worth watching?” … Just me then? That’s what I was afraid of. I’ll still watch them because I loved the original as well but it is never as good when they revisit old series. Not wanting to start another shirt-gate but why is the paragraph about the parabens and SLS only relevant to women? I choose my hygiene products carefully and even if only my wife did would I not want to know this information for her benefit (if I didn’t already know it)? I want to book a Marriott 7 day hotel vacation package. It is cheaper via mr&mrsSmith than through Marriott website (£1700 vs £2400). 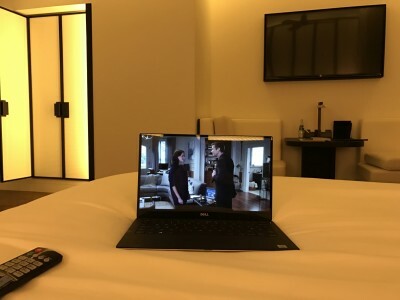 Will my Marriott gold still be recognised if I go for the cheaper option? Marriott is better than most at recognising status on third party bookings. You won’t get any points – not sure if Marriott allow points for incidentals on third party bookings? OT but the nearest post I could find – more info on the new BA routes from Manchester, including Ibiza!